Michi Photostory: Where’s Good to Eat in Big Sur? If you’re planning a trip to California’s coastal area Big Sur, you’re definitely in for a treat when it comes to things to see and do. With stunningly breathtaking views of the ocean from the dramatically high cliffs, a number of state parks where you can explore wildlife and natural beauty, forests and rivers which make for wonderful walks and picnics and a whole range of places to stay whether you’re looking for a luxury hotel room or a glamping site, this area has it made for those looking for a relaxing, nature-oriented and peaceful break away. 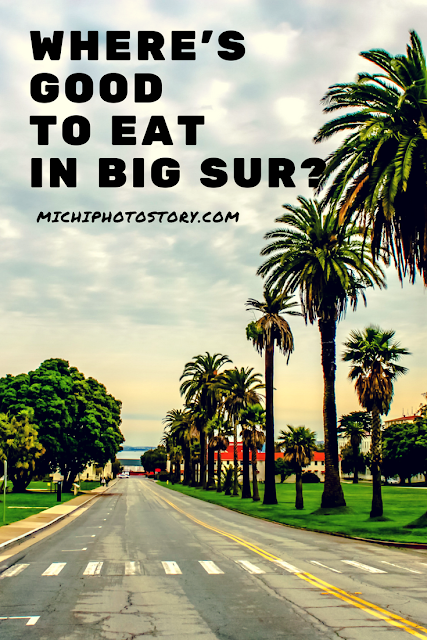 Of course, it’s always good to know where’s nice to eat when you’re traveling, which is why we’ve put together some of the best dining places in Big Sur. Whether you’re planning to spend the week in Big Sur or are taking a day trip to the area, Sierra Mar is a restaurant which simply cannot be missed. An experience of dining ‘on the edge of the world’ is rare to find, but this beautiful, unique restaurant which is located at the Post Ranch Inn, Big Sur, delivers it perfectly. Serving spectacular dishes that you won’t forget for a long time, you’re also met with stunning views out of the floor to ceiling windows that look out onto the Pacific Ocean. If dinner at Sierra Mar isn’t in your budget, they also serve a range of drinks and cocktails at the bar. Serving lunch every day of the year from 11:30AM through till 4:30PM, Nepenthe is the perfect choice of eatery to get light bites for lunch as you enjoy the amazing surrounding views. A family business which has been passed down through generations, Nepenthe boasts excellent hospitality, a relaxed environment, and of course fantastic food and drinks. Once you’ve finished your lunch, don’t forget to pay a visit to the on-site Phoenix shop, where you can find souvenirs in the form of Nepenthe logo items or unique, lovingly hand-crafted jewelry and personal care items which make great gifts for both yourself and others! The Big Sur Bakery is located in a picturesque spot and serves a range of dishes throughout the day to cater to all of your needs. The perfect choice for breakfast to start the day on a great note, the Bakery has outdoor seating where you can take in the sounds, sights and smells of the morning whilst eating your first meal of the day. Later on in the day, you can return to the bakery for lunch, with a selection of pizzas and other savory foods to choose from. This converted ranch house is a perfect choice of dining place no matter the time of day, with a range of home-cooked, wholesome meals to choose from for your evening meal. There’s also a bar which serves wines and a selection of other drinks. When it comes to dining in Big Sur, you’re definitely spoilt for choice. Whether you’re looking for a breathtaking view of the ocean with your food or a relaxing outdoor experience, this area has it all to offer.